Are you a mom like me, who is very busy with getting the kids to where they need to go, and keeping the house clean and getting the laundry done? If so you might not have a ton of time to devote to your over all appearance. Sure I’d love to sit down and take the time to polish my nails all nice and pretty before a special occasion so it can perhaps match my ensemble. However, time is off the essence and I need something that can be done super quick. 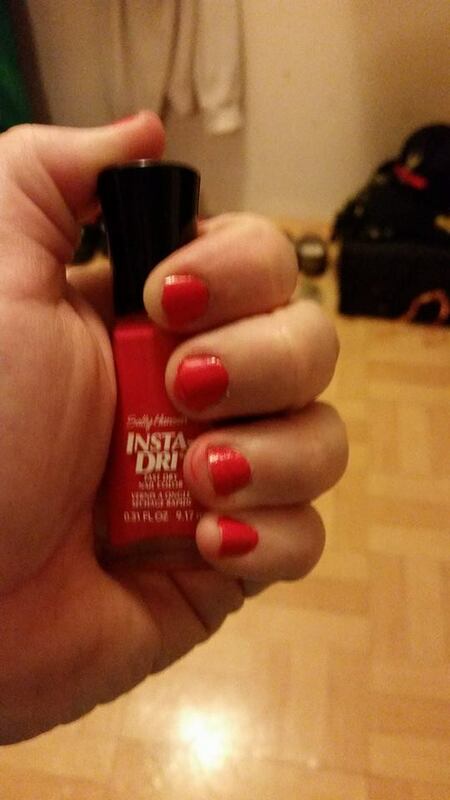 Which is what Sally Hansen’s’ Insta-Dri allows me to do. I was sent two different bottles to sample, they are the same just 2 of the very fun shades they have. A couple of things I noticed before even putting it onto my nails that I loved were the shape of the bottle and the shape of the polish brush. The bottle has more of a diamond/triangle shape to it. I thought that it would keep the bottles from rolling all over the place if you had a bunch and had to store them. The stick of the brush is flat opposed to the normal round stick that the brush is attached too. It makes scraping the excess polish off the brush easier and you’re not making a mess everywhere. The new design to the brush is also more convenient and better for nail coverage. The narrow flat shaped brush makes it easier to get the outside edge of your nail. I requested to sample the Sonic Boom color from the Insta-Dri collection. 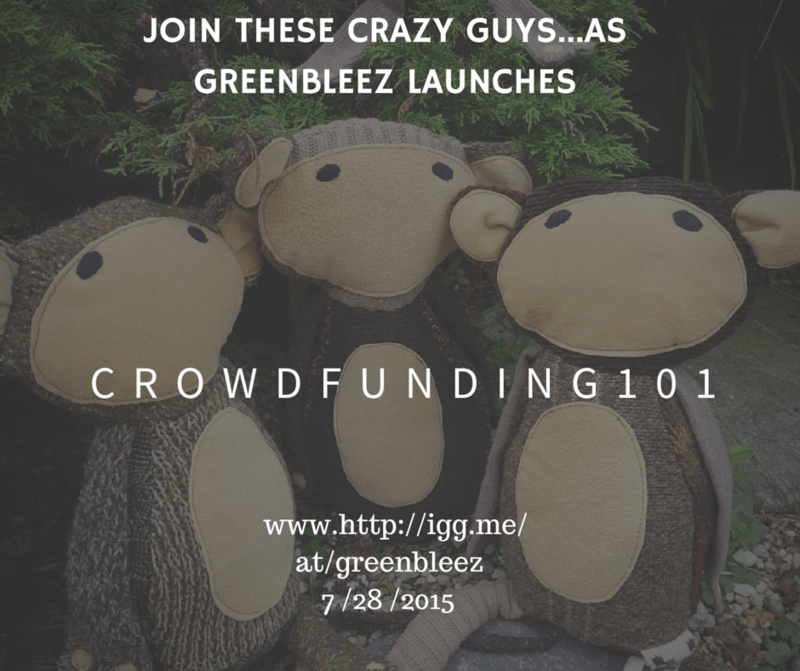 (Be aware that the colors maybe slightly different on their website then they are in real life. I noticed that the Sonic Boom color is more of a red in person, rather then the pink it looks like on the website.) This is what it looks like on both mine and my daughters hands. 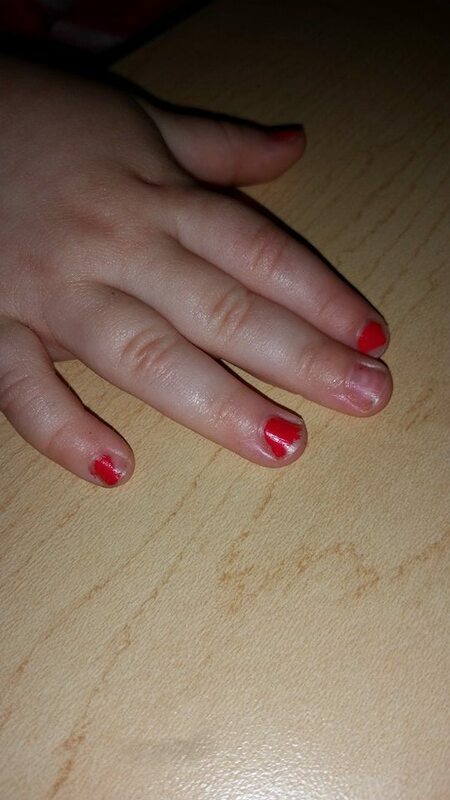 My daughter doesn’t sit for long when it comes to something like this so I figure this would be a good test as too just how quick Insta-Dri Nail Color works. Sure enough I was able to do all of her nails on one hand from her thumb to her pinkie. By the time I was to the pinkie the first 3 fingernails were completely dry. I don’t mean that almost dry like when you touch the polish and it doesn’t come off on your finger but you leave a finger print in the polish and it’s sticky. None of that, I did blow on it for a few second out of habit but when I did her other hand I didn’t blow on them and they did the same thing. You don’t need a ton either to cover the base of you nails. The polish has a rather flat looking appearance. It doesn’t shine, or have any glitz to it, so perfect for a real casual look. You could even spice it up buy using another color on top to make a design. I played around with mine and put dots on it. I went over my Pros for this product but I have one Con as well. 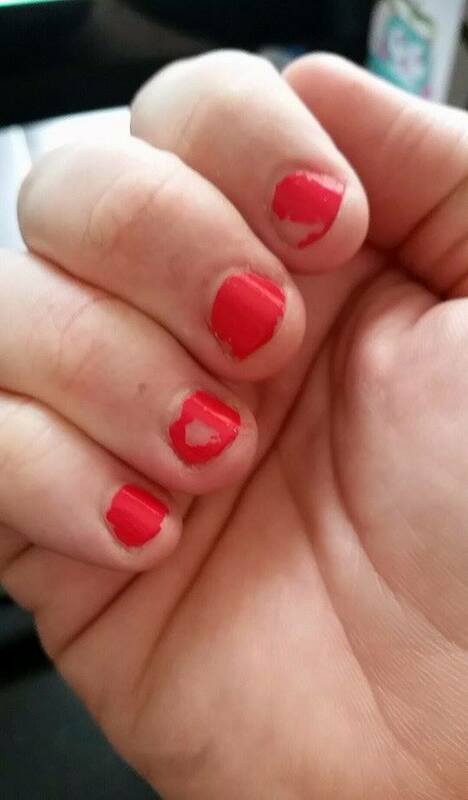 It’s been 1.5 days since I applied the polish to our nails and this is what they look like. 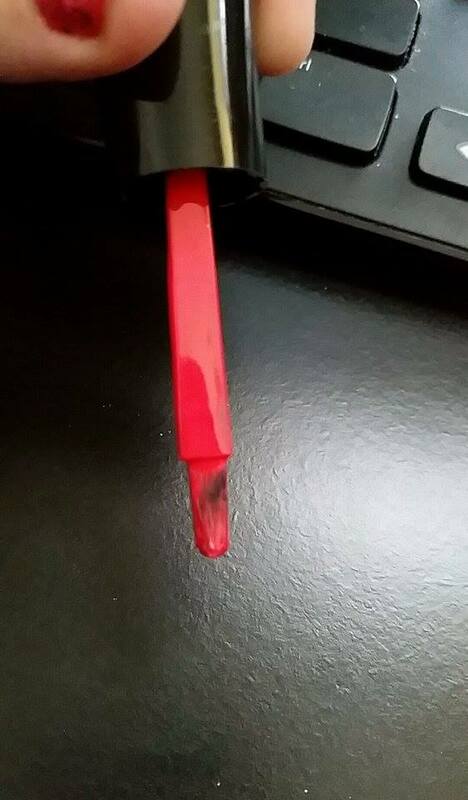 I feel like maybe a second or third coat may help prevent chipping so quickly. Or even a clear coat over top to maybe seal it. I do have my hands in and out of water all day, and my daughter does play around a lot but I feel like it should hold up longer then a day and half. These products retail in store from Walmart, Target and the Sally Hansen stores. Retail price anywhere from $4.00 to $6.00. 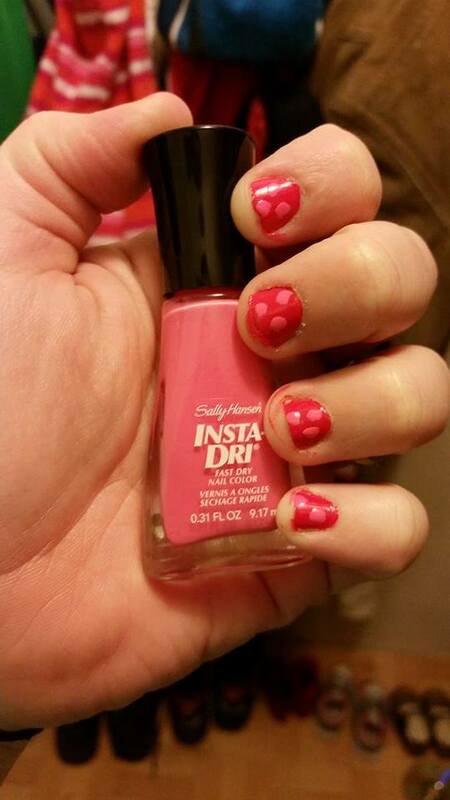 Check out more colors and other products by Sally Hansen on their Website, Twitter, Instagram and Pinterest.